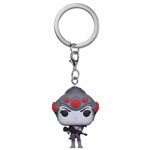 Widowmaker equips herself with whatever it takes to eliminate her targets, including mines that dispense poisonous gas, a visor that grants her squad infra-sight, and a powerful sniper rifle that can fire in fully-automatic mode. This Pop! Keychain features Widowmaker, rifle locked and loaded. Add her to your keychain today!